In June 1889 Gauguin and his circle mounted an exhibition of their work, described in the accompanying catalogue as Peintures du Groupe Impressioniste et Synthétiste. It was the first public manifestation of the movement known as the Pont-Aven School. About 100 paintings by Gauguin, Émile Bernard, Émile Schuffenecker, Louis Anquetin and others were displayed on the walls of the Café des Arts – now remembered as the Café Volpini after the establishment’s proprietor Monsieur Volpini – which had been set up temporarily inside the vast grounds of the Paris Exposition Universelle. Significantly, the exhibition at Volpini’s café was an independent venture, unrelated to the authorised artistic program associated with the exposition. Gauguin, ever- ambitious and still largely unnoticed as a painter, quickly seized the opportunity to present his work – albeit as an unofficial participant – at the largest world’s fair to date, celebrating the 100th anniversary of the French Revolution. 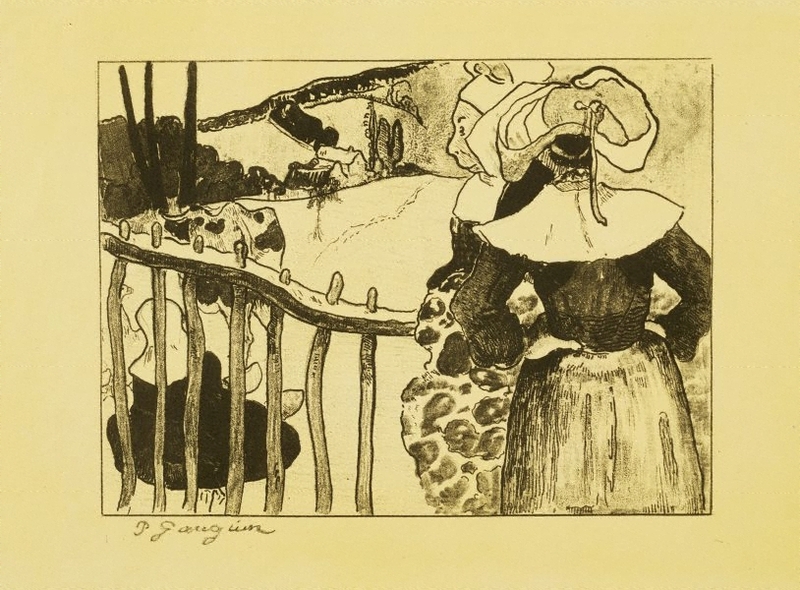 Among Gauguin’s contributions was a series of ten zincographs (lithographs drawn on zinc plates), including a frontispiece. Gauguin created the images – his first effort at printmaking – using a mixture of crayon and washes (lavis). The subjects were derived from his recent work in other media depicting places he had visited that were special to him, such as Brittany, Arles and Martinique. The lithographs were printed on large sheets of canary-yellow paper – probably influenced by Japanese prints, commercial French posters and even popular books called ‘yellow- backs’ – and were assembled in a portfolio with the frontispiece pasted to the cover. Although the prints were not on display, sets were available for viewing on request and were offered for sale at the Café des Arts for 20 francs. The exact edition size is not known, but fewer than 50 sets were printed. Gauguin’s decision to draw the lithographs on zinc plates was presumably because they were cheaper and less cumbersome to work with than the more conventional limestone blocks. Although zinc achieved a less polished result, Gauguin – who was cultivating a coarser, handcrafted aesthetic at this time – would almost certainly have favoured the more rustic-looking prints that this matrix produced. Breton women at a fence captures all that Gauguin loved about the Breton landscape: the rolling hills, the neatly bordered fields, the stone cottages and the country people and their distinctive costume. On the right, two standing women wearing starched collars and coiffes lead our eye across the composition in a zigzag motion, following the emphatic but smoothly flowing diagonal lines. A third figure in wooden clogs is seated on the other side of the wooden fence next to a brindled cow. The new style that Gauguin developed with Émile Bernard at Pont-Aven aimed to define a subjective reality beneath appearances. It was called Synthetism, and was seen above all in Gauguin’s paintings from 1888, which began to move in the direction of greater abstraction and simplification: ‘the synthesis of form and colour derived from the observation of the dominant element only’, as Gauguin himself described it. Unlike contemporary Symbolism, which had strong literary affinities and emphasised particular subject matter, Synthetism was primarily concerned with the formal questions of colour, rhythm and harmony and the means by which these could be synthesised with the observation of nature and the artist’s own personal experience. Signed l.l. sheet, [inscribed on plate] "P Gauguin". Not dated. Renée Free, AGNSW Collections , 'The Western Heritage, Renaissance to Twentieth Century', pp 108-172, Sydney, 1994, col illus p 140. Bruce James, Art Gallery of New South Wales handbook , 'Western Collection: Works on Paper', pp 78-92, Sydney, 1999, illus p 83. Paths to abstraction 1867-1917 , Sydney, 2010, illus p 149. Prints & drawings Europe 1500-1900 , Sydney, 2014, p 172, col illus p 173. Forest and field: from Claude to the Barbizon School , Sydney, 1995, p 8.